I don't know about you, but I am one of these girls that has favourite scents, and perfumes that I keep coming back to. You know how it goes. You find a scent that just makes your heart sing, and you feel just a little bit more buoyant when you wear it? 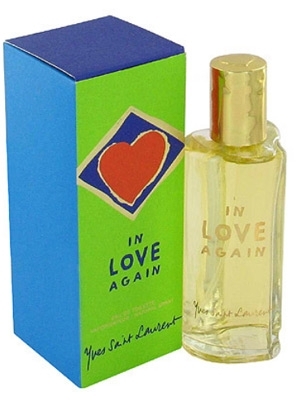 Well one of those scents is YSL's In Love Again. The original. Sadly they did it as a limited edition. And I don't have any any more. But my wonderful hubby did scour the net last year for my birthday and came up with something close. YSL In Love Again Fleur De La Passion. And I love it!!! A re-release that they tweaked just a bit. It's not quite as fruity, but still light enough that it makes the sun shine. Anyway, I had an idea the other day... I don't want to always be stuck in a fragrance rut, and sometimes it is good to try new things, so I wandered into my local perfume connection as I was leaving the shops the other day. You see they used to have selections of perfume samples that you could buy for very little - AND you got to choose which ones that you wanted to give a go. Short story - they don't do that anymore, however they DO just give you samples of whatever they have been sent (or should that be scent... :P ) so I have 3 to try out... mixed with my regulars, they should last me till the end of Autumn :) Sweet huh? I already tried Thierry Mulger's Alien a few years back (as a winter scent) and really liked it. So these are the ones that I am now trying. Do you have any of these scents? What do you think of them? Do they make your heart sing? I'm incredibly boring and predictable when it comes to scent - I wear Calvin Klein Eternity and have for an embarassingly long time, but for some reason it works for me. I've had people ask what it is that I was wearing and comment that they really like it even though it doesn't smell great on them! I am boring, one perfume Red Door which i have loved since forever, but think its definately something for me to update, been wearing it 17 years!!!! Now that i write that i really feel very boring... maybe a Mothers Day treat? Last birthday party for the month.